We are absolutely thrilled about this next tape release!! 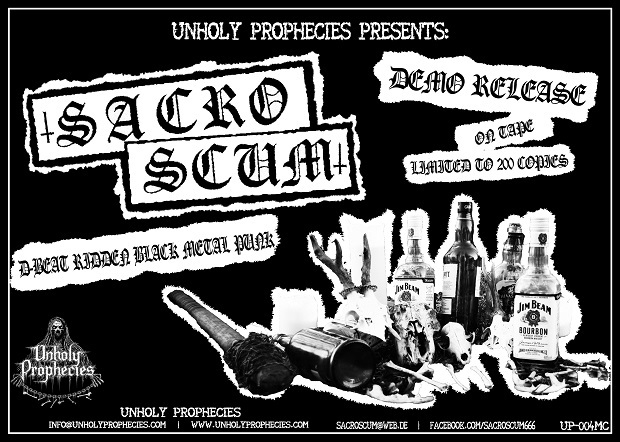 The mighty force SACROSCUM from the hellish South of Germany will release their first Demo through Unholy Prophecies!! This rancid and addictive D-Beat Black/Metal/Punk will surely apply to all those maniacs out there that like bands like DARKTHRONE, AURA NOIR, IMPALED NAZARENE and the likes. The Demo will contain 8 songs and will be limited to 200 copies. The exact release date and other details will follow very soon. In the meantime, go to the fridge, take a cold beer bottle and check some songs of the Demo that the band posted online some time ago.